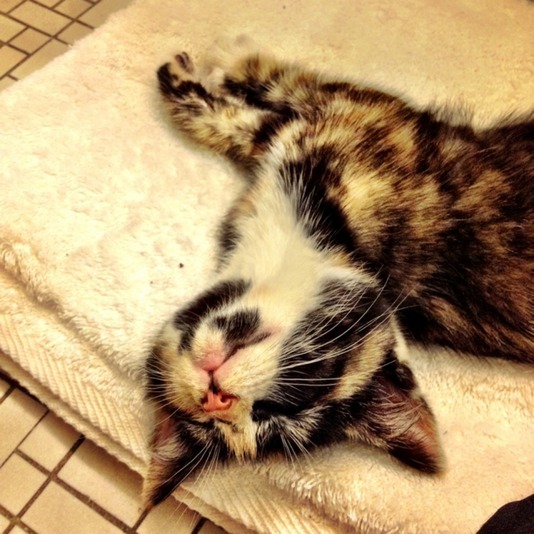 So, here’s the story about Mercedes the kitten. We’re driving along Ocean Parkway, headed to Brighton Beach for a morning at the beach. Sometime while we’re driving (I’m in the passenger seat) I hear what sounds like a cat crying. I don’t pay it that much mind as I figure we’re passing by some alley cats or something. Then, a little later when we hit a stoplight, I hear the sound again. This time I think that we have a cat in our car. I look out behind me and out the window and in the adjacent lane is see a Mercedes s550 with its left front turn signal light missing from the housing. In this housing is the little face of a kitten crying. Whoa! I open the window and wave at the woman driving the car. I grab her attention and point to the front of her car. “You have a cat inside your car!” I yell. She rolls down her window and I yell at her again. “What should I do? Is it dead?” she says. “No, pull over there,” I yell back. We both pull over to the service road on Ocean Parkway and like Avenue U or something. I tell her to shut down her engine. She does and gets out of the car and moves like 20 feet away, as if the car is on fire or something. I tell her again that there’s a cat in her car and ask her to pop open the hood. She has no idea how to do this. I can see the kitten sitting inside the housing where the turn signal lamp should be. She’s staring at me and I reach in to grab her and she disappears further into the engine. At this point, we’re attracting a small crowd. 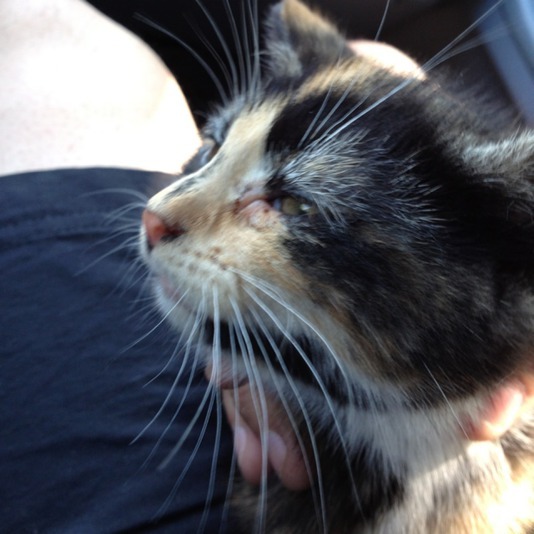 I’m asking people’s who walk by if they know how to open the hood of the car so we can rescue the kitten. Two guys get into the car and are searching for the hood release while I’m trying to reach in for the kitten. We all have iPhones, so we start Googling how to open the hood of an s550. In the mean time, I ask the woman who’s driving to call someone to ask them how to open the hood. This goes on for a while. Suddenly, I see a paw protruding from the right front part of the car, near the turn signal housing. It’s limp. Elizabeth and I fear the kitten is dead because the engine was so hot. I push at the paw and shove it back inside the housing. The kitten could not come out that way anyway. I could feel it an I poked it a bit and it started crying again. The driver said to me, along with some of the other people who were there (they may have known the driver) that it was now ok and we could go and she would either drive over to the mechanic or the police would take care of it. We did not agree that it was fine. We told her if she started the car it would kill the kitten for sure. I don’t think they were being malevolent in any way, I just don’t think they knew what to do. Some other guys also cautioned about starting the car. Now the kitten was crying. We finally got the hood open and I could finally see the kitten had moved a bit more towards the center of the car, between the radiator and the fan. She was looking up at us. I tried to reach my arm down, but there was not enough room and I kept burning myself on the radiator cap. Anothe guy started tapping underneath the car in order to scare her back towards the open housing on the left side of the car. That’s when she decided to take a left turn and head further into the engine block, out of our sight. CRAP!!!!! One of the guys helping saw her and said she was near an opening that she could climb down and exit the engine. I got on the ground and pushed myself under the car as much as I could. I saw the hole and a little bit of fur. I asked Elizabeth for some of her breakfast scone so that I might entice her to eat. The driver said she had some ground beef from the supermarket, so I took some of that too. I shoved my arm under the car and held the meat up to the hole. I could see the kitten and she became interested in the meat. She first poked her head out of the hole. I told everyone to be quiet so we wouldn’t scare her back into the engine. Finally she dropped one leg down then another. Finally, she dropped out of the hole and I grabbed her firmly and quick. We had a small crowd gathered and I’m holding her against my chest. Everyone’s thanking us and we’re thanking them, and the driver was relieved and happy. “Are you going to keep her?” a guy asked. What do you think was our answer. We all agreed that she should be named Mercedes. Merci (Mercy) for short. Welcome to our world Merci. What a start! We drove her right to the vet. She seems pretty healthy. Some conjunctivitis in her eyes. Maybe some worms. Possibly a few fleas if any. No feline leukemia (they have a 5-minute test they do now). She was starving and the vet gave her a can of food which she vacuumed down. No RFID tag under her skin. So things look good for her, at the moment. She’s now installed in one of our bathrooms, separated from the Men who, so far, haven’t freaked out. More updates as they come. Update – More pix here and a video too. You are a good man!!!! I just read your story on MSNBC. One of the few articles I thoroughly enjoyed! Please for the love of (benji) mercy share updates! So precious. Love to Mercedes, and you…her hero forever. from Buffalo, NY. What a wonderful story! I love all cats, but torties have a special place in my heart, which made this story even better. Thank you for noticing, and caring enough to rescue her. 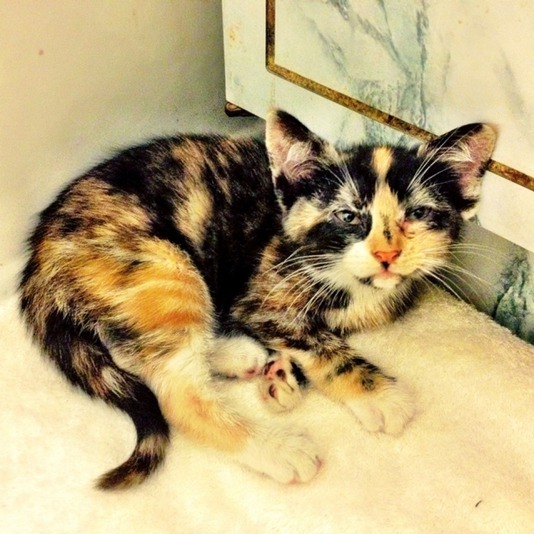 Ingrid: She’s not a Tortie – She is a Calico. 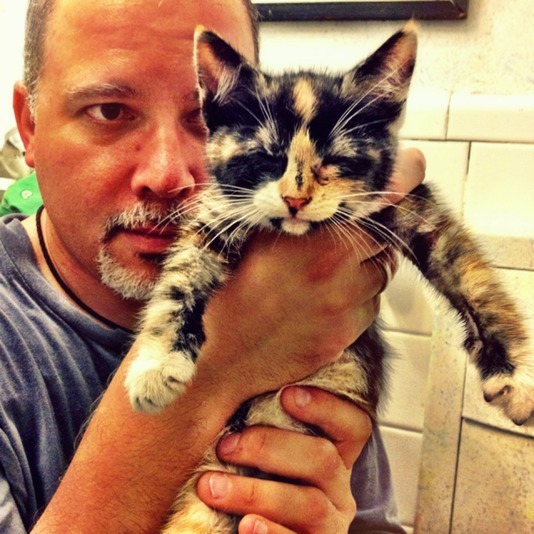 Torties ( tortoise-shell calico cats) do not have any white on them. I, too, have a special love for Calicos and Torties. What a great story. I just read your story on MSNBC as well, and it’s definitely made my day. She is an absolute cutie and I’m sure she knows you’re her guardian angel 🙂 You’re being there for her was pure serendipity and I wish you both many many happy years together! She is absolutely adorable. I’m so glad to hear of someone out there who cares about cats enough to go through all the trouble to rescue this little cutie pie! I’m sure she’ll be very happy with you and I bet the boy kitties will love her. I too have 2 older male cats and unexpectedly rescued a small female kitten early last fall. She was 4 weeks old and weighed less than a pound when we found her, and we just couldn’t take her to a shelter. Now she is the darling of the family and loved by both her big “brothers”. 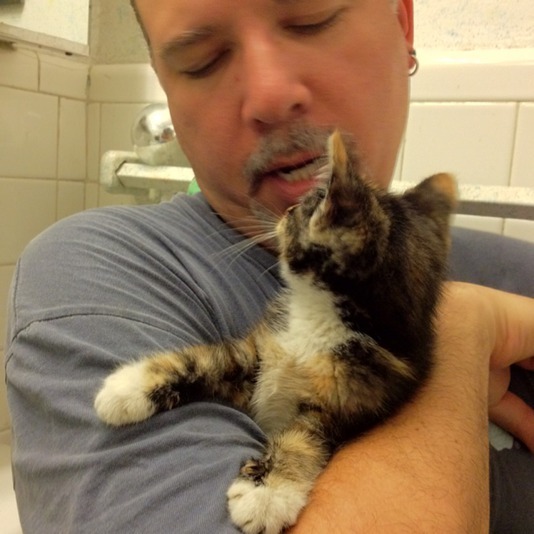 Coincidentally, I have also rescued a (different) kitten from a car engine! They get into so much trouble. 🙂 Good luck to her and to you! Thank you for rescuing this beautiful little girl! I lived in Park Slope, and know just where the rescue took place. I’m linked to many cat rescuers and have shared her story on Facebook. How is she doing now? She’s a beauty! Thank you for saving her. This story made my day, too! She is also quite the looker! I hope you know Merci will love you forever! Seriously, though…good for you for being astute enough to notice something was wrong and kind enough to do something about it. Best wishes to you and your lovely girl. Merci, or Mercy, has died and gone to heaven. Rosario, you rock. This is a story for a book of photos for cat freaks to enjoy. We would love to see her growing up, interacting with the boys, being loved like a princess. There must be a mother and other kittens where she came from. What a beauty! I think we’ve determined that Merci is a calico, but the majority of her is tort. Picture updates posted today. Cuteness abounds! Looks like I have my work cut out for me then. I’ll post updates both here and on Facebook, though I may eventually move all her updates there. And thanks! She’s a darling. Thank you. Considering the luck and timing, surely a gift from the gods. Thanks so much for saying that. Finally, some good news for a change. Thanks you. She’s doing great. Eyes are clearing up. Still an issue with the worms maybe, and lingering fleas… But, healthy in all other respects. Pretty perfect actually. You’ll get no argument from me! 🙂 Thanks. There are so may weird and remarkable stories of cats hitching rides under cars. One of my cats Nieux Neiux, as a kitten hitched a ride under my neighbors truck out of the region wreaked by Hurricane Ike . nearly 150 miles to Victoria Tx. . She was covered iin shells, oil and beach tar, had a fractured pelvis that had recently been very skillfully repaired ( probably a $1500 surgery) and a broken front foot, eye damage and a lot of scrapes and a diaphragmatic hernia,. It took time for her to walk properly but her fondness for rice and beans seemed to indicate an origin in Cajun country where my neighbor’s truck was parked at a high spot for a week during the storm. She doesn’t like storms . We all wish she could tell us her story! Thank you so much for rescuing her and going through all the troubles. While reading about the story, I can’t help but to think about the timing of it all, maybe it was fate. About two years ago, I took in a stray kitten myself. She was ready to die as the elements of outside life got to her. I scooped her up in a box, went to the vet and she was diagnosed with an upper respiratory infection, conjunctivitis amongst other things. Years later, she’s a vibrant and loving 12lb cat. Best decision I’ve ever made. I believe Mercedes is beyond grateful in you rescuing her and now she has a home. We need more heartfelt stories like this these days, thank you for being her Angel. what did ann marie mean when she commented that merci had “died and gone to heaven”? i hope this story doesn’t have a sad ending! Grace, I thought the same thing! I think what Ann Marie meant was that Merci/Mercy is now in “heaven”, being in a wonderful and loving home! You are an awesome individual. Thank you from Mercedes and I. Thank you for saving Mercy !!! You are an amazing person, thank you from me and all the cat lovers out there. She and you seem like a perfect match and will give one another much joy and love. Congrats she is gorgeous! wonderful story. you are such a good man. she is a most beautiful little kitty. torties are the best. bless you! Amazing! I wish everyone was as kind and loving to animals as you are. WOW!! What a great story! It brought tears to my eyes. Every cat I have ever owned has been a stray, and I have a special soft spot for calicoes, so this story truly touched my heart. She is such a lucky cat, and it sounds like she’s gonna have a great life! She’s positively beautiful and what a wonderful story. THANK YOU for rescuing this beautiful baby girl. Where can we follow this story and photo update on Facebook? yea for you!!! You are one of God’s finest. She was so fortunate to be saved by such a wonderful person. There are a few of us left out there. God Bless You Sir! (And everyone that helped.) What a wonderful story. The poor baby must have been terrified. Could the vet give you any idea as to her age?